Summer vacation is already here! A lot of students, together with their family or friends, are looking for new things to do this summer which are budget-friendly and easy to access. 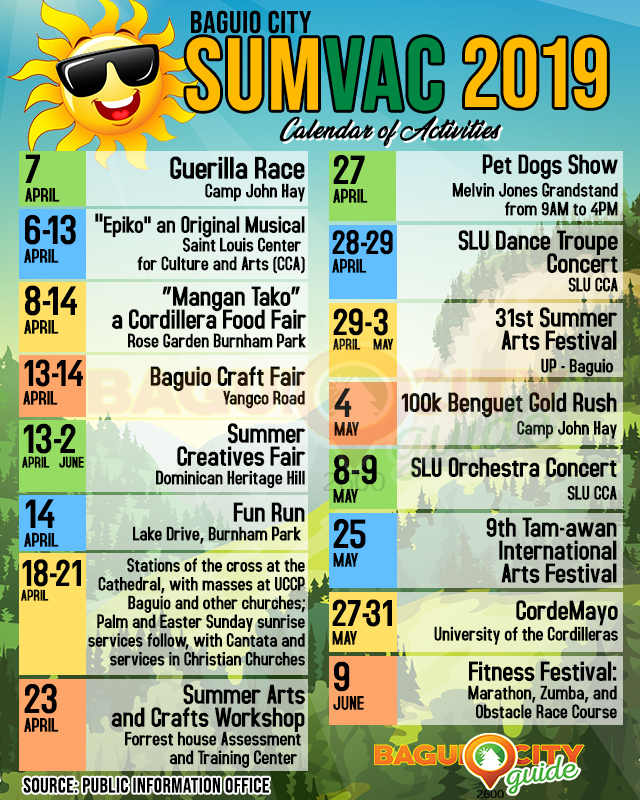 If you’re planning to make this year’s summer extra special, you might want to check out the SUMVAC 2019 Calendar of Activities in Baguio. And with lots of activities lined up for this year’s summer vacation, there wouldn’t be any dull moment when you decide to stay in the City of Pines. And if you’re wondering what makes this year’s SUMVAC in Baguio special, here’s a short list of things you can do in the city at this time of year. Are you looking for a fitness activity that will help you to maintain your figure? Worry no more because a Guerilla Race in Camp John Hay will be held on April 7. But if you won’t be available during this day, you can still join the 100k Benguet Gold Rush in the same venue on May 4. Also, on April 14, there will be a Fun Run at the Lake Drive along Burnham Park. Aside from these runs, there will be a Fitness Festival on June 9, where a Marathon, Zumba, and an Obstacle Race Course are set to happen. Sign your dog up for the Pet Show. Dogs are lovable creatures. They’re definitely good companions that serve as man’s protector and stress reliever too. If you are a dog lover and you want your dog’s talent to be showcased and discovered, then don’t miss the Pet Dogs Show to be held at the Melvin Jones Grandstand on April 27, 2019 from 9 AM to 4 PM. Enjoy watching several cultural perfomances to be held at the Saint Louis Center for Culture and Arts (CCA).”Epiko” an original musical will be on April 6-13; SLU Dance Troupe concert on April 28 and 29; and the SLU Orchestra concert on May 8 and 9. Savor an extraordinary gastronomic experience. According to City Tourism Officer Engr. Alec Mapalo, indigenous-infused gourmet cuisine shall be showcased at a Cordilleran Food Fair entitled “Mangan Tako.” This is in coordination with the academe. So join and taste the first creative gastronomy, featuring local and indigenous food, on April 8-14 at the Rose Garden, Burnham Park. Indulge in a creative experience. On April 13 and 14, the Baguio Craft Fair will be held along Yangco Road, while the Summer Creatives Fair shall be at the Dominican Heritage hill from April 13 until June 2. On the other hand, the Forest House Assessment and Training Center will host a Summer Arts and Crafts Workshop on April 23. And in celebration of the 31st Summer Arts Festival, the University of the Philippines will be hosting the Cordillera Dance and Music Workshop from April 29 until May 3, 2019 for free. The activities included are the following: mixed media painting, teen theater, hand building pottery, photography, and soil painting. May 25 will be the celebration of the 9th Tam-awan International Arts Festival while the CordeMayo to be held at the University of the Cordilleras May 27 to 31, 2019. Join spiritual activities during the Holy Week. In observance of the Holy Week, Stations of the Cross will be done at the Cathedral. UCCP Baguio and other churches will be holding masses; Palm and Easter Sunday sunrise services will also follow with cantata and services in Christian churches on April 18, 19 and 21. Whether you’re a tourist or a local of Baguio City, you can enjoy your stay in the City of Pines with all these activities lined up for you. So what else are you waiting for? Start planning so that you can make the most out of your summer vacation in Baguio.